In what was one of the most fascinating hearings in years, SpaceX CEO Elon Musk and United Launch Alliance (ULA) boss Michael Gass faced off against each other over the lucrative Evolved Expendable Launch Vehicle (EELV)-class contracts. 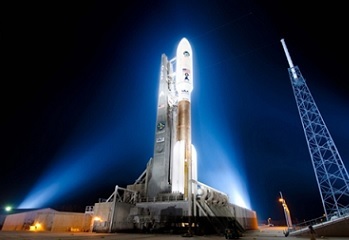 Both gentlemen didn’t pull their punches, with Mr. Gass cited ULA’s superior reliability, while Mr. Musk denounced ULA’s costs, even claiming they should cancel their Atlas V rocket. Currently, the ULA fleet of Deltas and Atlas V vehicles carry out the vast majority of USAF launches, which SpaceX has previously class as a “monopoly provider whose prices have consistently risen”. This remained part of the focus of Mr. Musk’s comments during Wednesday’s hearing. There has been a historical disagreement between the two companies that stem back to the legal arguments which resulted in court action in 2005, where SpaceX tried to block the formation of the ULA between Boeing and Lockheed Martin. As such it was unsurprising that the leaders of both companies traded blows – albeit in a civil fashion – during the hearing. Chaired by Sentator Durbin, who provided an interesting, informed and fair set of questions for the witnesses, the Defense Subcommittee’s focus was on the National Security Space Launch Programs. Both leaders placed their rockets in opposing corners of the political boxing ring, before facing each other to trade blows over reliability and cost. ULA found a likely ally in Senator Shelby – representing the State of Alabama, where ULA’s Decatur plant is located. 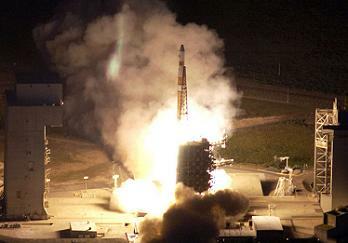 The Senator was the first to be introduced by the chairman, wasting no time in pointing out ULA’s impressive success rate – classed as 68 consecutive mission successes. The Senator was alluding to the big talking point facing the forward path of the EELV program, the upcoming slice of EELV launch contracts, amid a new direction that attempts to allow for competition among those providers that have – or will soon have – the required certification. Mr. Gass also pointed out his company’s record of reliability, outlining ULA also launch numerous other payloads into orbit, including high profile flagship missions for NASA. “For NASA, we have launched science missions to the Moon, Mercury, Jupiter, and Pluto, and even sent the rovers on their way to Mars. Our customers extend beyond government to the commercial sector with nine commercial missions to date and several more on the manifest. “I am pleased to report that ULA and the government team have consistently delivered 100 percent mission success over 68 launches since the inception of the program. We are currently at a tempo of about one launch every month. ULA’s Atlas V and Delta IV rockets are the most powerful and most reliable in the world. Mr. Gass’ opening remarks – which included a note that ULA are looking towards an Arianespace-style arrangement where they can launch two satellites together on one vehicle – mainly focused on his companies successes. Mr. Musk provided with a similar outline of his company’s goals, also citing reliability and safety – while adding an extra word, “affordability” – as SpaceX’s aspirations. 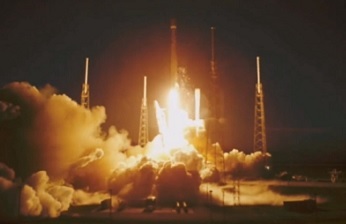 The SpaceX founder noted his company is the fastest growing launch services company in the world, with 50 contracts worth $5 billion on the order books, with the Falcon 9 rocket launching eight times, including four successful launches for NASA – with another Dragon set to launch to the ISS this month – along with three successful launches commercial satellite missions under its belt. 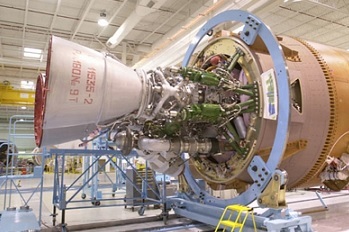 He also noted the company is scaling their production operations to produce 40 rocket cores and nearly 400 rocket engines annually later this year and are already the largest rocket engine manufacturer in the world, all while they continue to push the envelope on rocket technology, as they advance toward fully reusable launch vehicles and the development of the Raptor engine (new article coming this week). Mr. Musk also wasted no time in pointing out the vast differences in costs between ULA rockets and SpaceX launch vehicles. Mr. Musk also noted that SpaceX’s EELV certification process included a number of requirements that were never demanded of ULA. However, SpaceX has now achieved three flights of their upgraded Falcon 9 v1.1 rocket – one of the certification requirements. 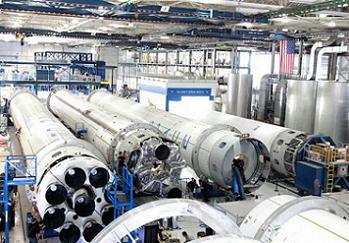 SpaceX is also now undergoing a review process, involving 30,000 data items and total access to their rocket systems. Mr. Musk hopes the certification process will be completed this year. With EELV competition encouraged by officials, per direction provided a few years ago, Mr. Musk appeared to be discouraged by the potential delay in allowing for upcoming missions to be competed, claiming he’s heard only one mission will be up for grabs this year. A total of 14 upcoming missions are being lined up for competition. 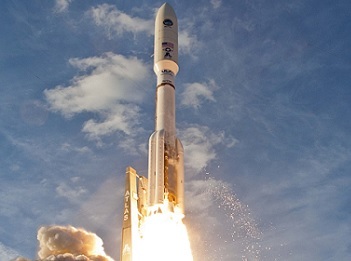 Mr. Musk’s main target was the Atlas V, which uses the Russian-built RD-180. SpaceX vehicles are exclusively American. “Our Falcon 9 and Falcon Heavy launch vehicles are truly American. We design and manufacture our rockets in California and Texas, with key suppliers throughout the country. While the benefit of US tax dollars being spent on US built hardware has been a point often made during economically challenging times, Mr. Musk cited the ongoing tensions between Russia and the West over the Ukrainian crisis as a negative point for one of ULA’s rockets. Chairman Durbin questioned Mr. Gass with regard to potential sanctions against Russia, with the ULA head noting they have some level of accommodation, per current engine stock and the possibility of manufacturing the RD-180 in the United States. “What we have done to protect against that concern is that we have over two years of safety stock inventory in the US. We also have another product (Delta IV) that is fully compliant and ready to support any of the missions,” noted Mr. Gass. 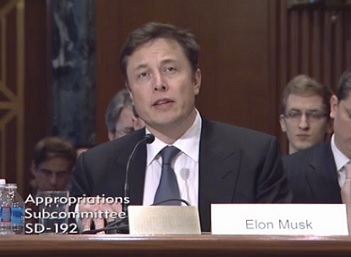 Later in the hearing, Mr. Musk countered that the two years of stock does not allow for the claim of assured access to space, given the EELV 36 core contract is based over a five year period. However, he would first counter ULA’s success rate. Mr. Gass later countered back, noting they judge mission success on the customer’s declaration of success. Senator Shelby also got involved, pointing out SpaceX placed a secondary payload into the wrong orbit, leading to the loss of the satellite. The secondary payload referenced was likely the Orbcomm O2G-1 communications satellite; a prototype for Orbcomm’s second generation constellation slated for launch on upcoming Falcon 9 v1.1 missions. 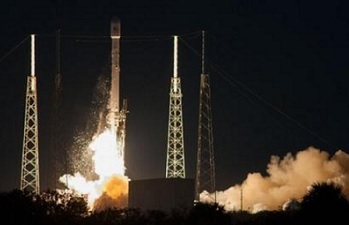 While the Falcon 9 launch of the Dragon CRS-1 mission was successful as a whole, the launch suffered an engine problem during first stage flight which played a part in the loss of the Orbcomm satellite. The number 1 engine failed approximately 79 seconds after launch; being shut down by the onboard computer after it lost pressure. Debris was seen falling from the rocket, believed to be part of a fairing designed to protect the engines from aerodynamic loads. While the failure was within the Falcon 9′s engine-out capability, it resulted in the second stage burning more propellant than had originally been planned in order to reach the planned orbit for Dragon deployment. As a result the stage failed a propellant mass check at engine cut-off, and the Orbcomm satellite was dumped into an orbit that was not planned. “By ULA’s definition of success, that mission was perfect,” responded Mr. Musk with a grin on his face, before Mr. Gass quickly countered it would have not been classed as successful at ULA. As a potential route forward, where both ULA and SpaceX conducted EELV class missions, Mr. Musk believes such a scenario would involve the Falcon family and the Delta family. He noted that ULA should phase out the Atlas V, a somewhat cheeky comment, based on Atlas V’s other roles outside of the EELV realm, including the planned launch services for two commercial crew competitors that are battling against Mr. Musk’s Dragon spacecraft. While reliability and assured access are key factors, the whole purpose of the Department of Defense’s move towards an element of competition is based on reducing costs, which have been rising at an alarming rate. Under the Air Force’s plan to reduce EELV costs, 36 missions have been sole-sourced as block buys to ULA, while SpaceX will compete for 14 flights, which will be competed, with no guarantee SpaceX will be awarded any of those 14 missions. In highlighting the cost difference, Mr. Musk noted that while such launches will cost a lot more than the prices they offer to commercial launch service suitors, it will still be far less expensive than the cost of using the ULA fleet. “The US government does not buy launch insurance, so there is a mission assurance overhead applied (to the price). Our launch costs are estimated to be 50 percent higher than commercial flights. Mr. Gass later claimed Mr. Musk was claiming figures that were “categorically wrong”, without noting which numbers were in error. However, he did note – per a chart that was presented at the hearing – that the portrayed up-curve in costs was reflective of appropriations, not cost or cost performance. Importantly, when asked if ULA is ready to go into battle with SpaceX for the remaining EELV contracts, Mr. Gass was buoyant. 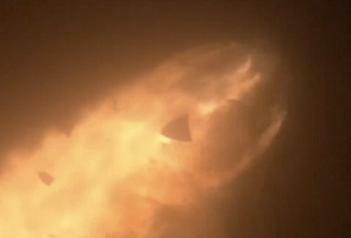 (Images via Hearing Webcast, ULA, SpaceX and Lockheed Martin).